Welllll things are a little complicated right now. I have a few decently good ideas about where I will be going and when, but some of my Canada plans just fell through and I need to find something else pretty soon. I was going to be traveling on an icebreaker (the Amundsen) doing research in the Canadian Arctic, starting August 18th out of Quebec. I was officially invited to join an expedition on said icebreaker from September 28th to October 16th out of Kugluktuk. Turns out that while I will definitely be on the ship starting in September, there's apparently no room during the first leg of the trip for me to come along. This is a bummer, not only because being on the icebreaker for the first few months would be fantastic, but also because it means I'm suddenly needing to find something to do - and somewhere to go - in Canada for the first two months. And since I have to be gone by August, that's really pretty soon. I still have a few leads - the ship may find room, I may be able to work in a lab somewhere in Canada - or I may be in touch with some brand-new contacts and who knows what willl happen! I'm trying to avoid just sort of showing up somewhere...but if I must that'd certainly be an interesting experience. Moving on! The next stop after that will most likely be a little place called Ittoqqortoormiit in eastern Greenland, starting mid-October. To my current knowledge, I will be teaching English in the local school there. Really a stroke of luck - the regular teacher is going home to Denmark for the exact time period that I was planning to be in Greenland. I am very excited about this opportunity, but hope it all works out...the plans are a little hazy at the moment. Interesting fact about Ittoqqortoormiit: seems almost impossible to actually get to. There are no flights from Canada or the USA to Greenland - none whatsoever, ever. So I'll fly from Quebec to Iceland, then to southern Greenland, from where I will have to take a helicopter or some kind of chartered flight out to Ittoqqortoormiit. After Greendland: Norway! 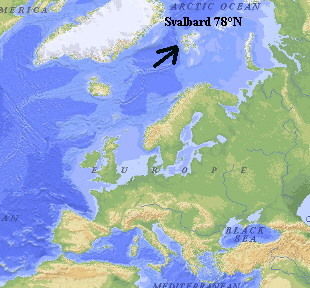 Starting in January 2007 I will be staying in Longyearbyen on Svalbard, which is an archipelago north of mainland Norway. Longyearbyen was the city base of the research I did last summer on the little auks. In Longyearbyen I will be working with the local Arctic university doing some biology work. Finally I will be getting into Russia, most likely starting in May. I really am not sure where I'm going in Russia yet - it's a bit of a problem that I don't speak Russian, especially in northern Siberia. We'll see. So there's a basic idea of whats going to happen. Unless I pull together something really fast for Canada, then I will probably be leaving at the tail-end of July. I'm also in the middle of getting together my gear. I just got my jacket last week, now I'm looking for a backpack and some other specialized clothing. Almost none of which can be found in southern California, in the middle of the summer. Basically this institution gives graduated undergraduates the chance to pursue a personal project totally independently, with minimal guidelines and some very basic requirements, like...stay out of the USA for a full year, let us know where you are, and attend a conference when you get back (there's 50 fellows this year, we all meet when we get back). My project involves a photographic examination of social and personal strength in a variety of cultures coping with the extremes of the Arctic. Through photographic imagery, I will document patterns of communication, tradition, emotion, and social interaction as I participate in each community living through a stage of the Arctic seasons. The project will entail capturing and effectively sharing the experience of living in the Arctic, displaying not only my personal experiences but also the social patterns of communities working successfully in climatic extremes. So! I have to be gone (out of the USA) by August 1st, 2006. Right now I'm getting ready, from planning where exactly I will be living, to trying to find side jobs (I can't do photography ALL the time), to figuring out transportation, to figuring out how my new fancy camera works. And trying to learn Russian. I know lots of you are curious about my preparations and this trip in general, and I also know I won't be able to keep in touch personally with all of you - I really have no idea how much access I'll have to mail, phones, or internet, but I'll keep this updated as often as possible. Hopefully this site will give you an idea of where I am, what I'm up to, and, most importantly, show you some fantastic photos and give you some interesting stories. Note to self: buy cod liver oil.